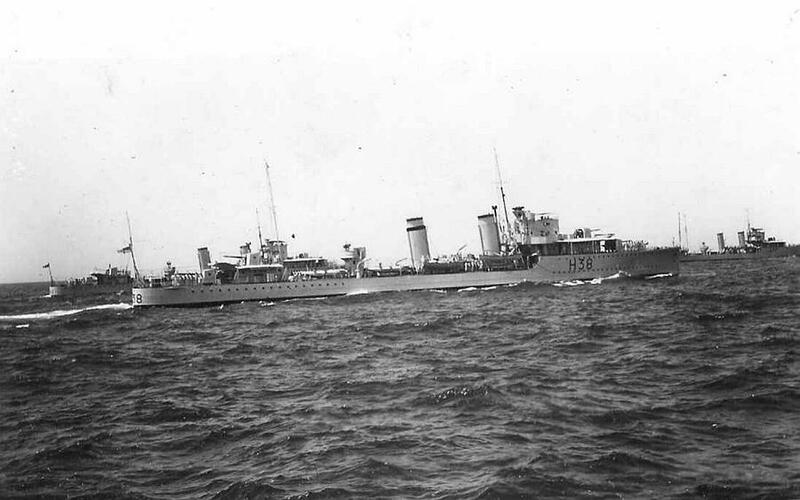 D or DEFENDER-Class Fleet Destroyer ordered from Fairfields at Govan, Glasgow under the 1930 Build Programme. The ship was laid down on 22nd April 1931 and launched on 2nd June 1932 as the 12th R N ship to carry the name. It was used by a mercantile which fought against the Armada and previously borne by a Gunboat in 1856, later renamed MA STARR. Build was completed on 31st January 1933 for a contract price of £229,378, excluding the Admiralty supplied equipment such as weapons, ammunition and wireless equipment. Before Joining the 1st Destroyer Flotilla in the Mediterranean the ship carried out trials on the Mark IX torpedo and arrived in Malta during May 1933. Later that year she spent about two months on detached service in the Persian Gulf. On return to UK in August 1934 she refitted at Portsmouth before re-commissioning for service on the China Station in the 8th Destroyer Flotilla. In September 1935 she left the China Station for two months during the crisis in Abyssinia and was deployed at Aden for two months and resumed duty at Hong Kong early in 1936.Before the outbreak of war with Germany she sailed to take up her war station in the Mediterranean. September On passage to Malta. October Deployed for Contraband Control and screening duties in Mediterranean. January Under refit at Portsmouth. 27th Took passage to Scapa Flow on completion of Post Refit trials. Deployed in NW Approaches for Fleet screening and anti-submarine patrol. April Deployed for Fleet screening duties. 8th Sustained weather damage necessitating return for repair. May On completion rejoined Home Fleet for support of Norwegian operations. 31st Evacuated Scots Guards from Bodo with HM Destroyer ECHO. 7th Escorted troop convoy from Norway after evacuation (Operation ALPHABET). ARDENT and ACASTA. See above references.). 21st Taken in hand for refit and exchange of boiler tubes at Rosyth. Nominated for service in Western Approaches. 24th Took passage from Rosyth via English Channel. position 50.12N 02.17W 20 miles SSW of Portland Bill. Hit on foc'sle caused major fire and subsequent explosion. Ship sank with loss of 6 of the ship's company. Norway and during the evacuation of allied troops from Dunkirk and France. This name was carried forward when used for a Fleet Destroyer of the DARING Class in 1950. She was to have been named DISDAIN but the name was changed to DELIGHT before launch on 21st December 1950. She served on the Active List until scrapped in 1970.